From November to December, Live Ventures tripled on the back of aggressive paid promotions. Promoters have been paid as much as $2 million to hype Live Ventures. Same promoters as imploded fraud Forcefield Energy which was delisted and went to zero. Latest LIVE bull was permanently barred by the SEC for “egregious” stock fraud. Company created “earnings” via multiple one time discretionary accounting gains. Auditor was cited in 2016 for egregious and extensive audit deficiencies. Company’s recent acquisition of “Vintage Stock” is effectively a continuation of now bankrupt Blockbuster, and has actually acquired its locations from Blockbuster and bankrupt Borders. Live Ventures has just $770,000 in cash remaining. This article is the opinion of the author. Nothing herein comprises a recommendation to buy or sell any security. The author is short LIVE. The author may choose to transact in securities of one or more companies mentioned within this article within the next 72 hours. The author has relied upon publicly available information gathered from sources, which are believed to be reliable and has included links to various sources of information within this article. However, while the author believes these sources to be reliable, the author provides no guarantee either expressly or implied. I first became aware of Live Ventures a few years ago when I was investigating and exposing an illegal stock promotion firm called The Dream Team Group. At the time, the company was known as Live Deal and one of the Dream Team promoters was moonlighting, also writing for another stock promotion firm. That firm was looking to recruit writers to write undisclosed paid promotions on Live Ventures. My first article at the time exposed the Dream Team and their two primary promotions, Galena (NASDAQ:GALE) and CytRx (NASDAQ:CYTR). I then followed up with various other articles exposing many other related stock promotions. A few of them were stocks which I had shorted, but with many more of them, I highlighted their problems just for the sake of cleaning up the market, even though I had no financial interest. As expected, nearly all of these promotions (once exposed) fell by at least 90%. Executives resigned. SEC investigations ensued. Shareholder lawsuits were filed. Some have been delisted outright and gone to zero. As always, there had been volumes of supposed “analysis” of each of these companies’ business prospects. And, of course, in each case, the business appeared to be compelling. But as is always the case, whenever I find evidence of the individuals, promotion firms and tactics of stock promotions, these businesses ALWAYS end up failing. The purported business descriptions and developments are nothing more than manufactured fantasy. They are designed to sound great for the sole purpose of luring in retail investors. And then they fail. In the end, there were still many other stocks which I had come across but which I never got around to writing about. In some cases, the stocks were too small and illiquid for anyone to care. In other cases, they traded for just a few pennies. And in some cases, I simply had too little information at the time to merit a full report. But over time, some of these legacy stock promotions rear their heads again, so I do try to keep my eye on them. Live Ventures is one of those stocks. As with the others, I will demonstrate clearly the view that Live Ventures is nothing more than a paid stock promotion with negligible business prospects. Investors have been grossly misled into bidding up the stock price by several hundred percent in just a few weeks. As investors see the true background facts, I expect the stock to quickly implode just like the others. There are so many blatant problems behind the promotion of Live Ventures that it is difficult to know where to start. PART A – THE ONGOING PAID PROMOTIONS, INCLUDING THROUGH DECEMBER 2016. Here I will show how millions of dollars have been paid to some of the most notorious stock promotion firms which happen to still be operating. Live Ventures is being promoted by the same firms I have exposed in the past and who were responsible for the promotion of stocks such as Forcefield Energy (NASDAQ:FNRG), among others. Following my exposure of Forcefield, the stock fell by 60% within days. The Chairman was promptly arrested by the FBI as he tried to flee the country. The stock was then halted and delisted, going to zero all within a few trading days. I will show how these firms often interact with one another to obscure the nature of the ultimate paying party for the promotions. Buried deep in the disclosures, we can see that the promoters end up admitting to us that they are being paid to present deliberately skewed information for the sole purpose of making stock prices rise. The promoters have explicitly noted that stock prices typically rise sharply during their promotions campaigns, at which time they sell their own shares into the hype. Again, the information is hard to find, but in order to absolve themselves of liability, the promoters warn that most investors who invest during their campaigns will lose most or all of their money when the stock prices crash. Additional warnings (included below) should generate similar levels of concern. Wherever possible, I include the stock promotion firms involved as well as the dollar amounts they have been paid. These promotions have been ongoing even through the month of December, even on the last day or two before the stock exploded to over $30. But now the paid promotions appear to have come to an end. The share price has been falling almost every day since earnings were released, even on light volume. Without a promotion in place, there simply aren’t buyers willing to support the stock. Anyone who buys into the stock with this knowledge is deliberately signing up to lose money into the hands of professional stock promoters who know that the stock is about to collapse. Buying Live Ventures under such circumstances is literally downright idiotic. In Part B I show how Michael Markowski became an aggressive “bull” on Live Ventures just beginning in November 2016, right as the simultaneous paid promotion began to take off and the stock price began to triple. Mr. Markowski has now written on Live Ventures 9 times in less than 6 weeks. He dramatically urges investors to buy “at market” – not using limit prices and “recommends” continued purchases even as the price went higher and higher. Mr. Markowski assures investors that Live Ventures will soar to as high as $180 (a 9 bagger from current levels) during 2017. Perhaps his perfect timing on getting involved with Live Ventures was pure coincidence. Or perhaps not. Many of the statements included in Markowski’s articles are flat out wrong. Yet investors have relied upon this inaccurate information to buy shares of Live Ventures at ever higher prices. Details on these inaccurate statements are provided below. Mr. Markowski regularly touts his deep and lengthy expertise in the securities industry acquired over 40 years in the business. But he blatantly fails to disclose that the SEC charged him with a host of securities fraud violations which it described as being so “egregious” that barring him from the industry was “in the public interest”. Markowski’s conduct was egregious. The complaint in the injunctive action describes the manner in which Markowski knowingly and recklessly manipulated the market prices of three Global-backed securities, including aggressive and fraudulent sales practices, unlawful solicitation of aftermarket orders during initial public offerings, and delayed execution of the sell orders of Global customers. In other words, Markowski would use fraudulent means to induce customers to buy securities at manipulated prices and then his brokerage would prevent them from executing their sell orders (sometimes for months) even as the stocks plunged. This is eerily similar to the content of his recent articles in which he keeps urging investors to buy “at market” and then to buy more even after the stock tripled. Investors are strongly urged to never sell. Markowski has provided no credible assurance against future violations. Indeed, Markowski’s testimony bespeaks a complete lack of understanding of, and appreciation for, the regulatory scheme governing the securities industry. The vast, vast majority of individuals in the securities industry will never have any sort of violation on in their history whatsoever. When the very rare person does, they will be penalized. A bar from the industry is a truly rare occurrence reserved for the worst of the worst violators in the business where the SEC feels it needs to protect investors from their further behavior. All promotions need some sort of talking points to get investors excited. These can often be acquisitions or other corporate events. The “fodder” is then echoed and amplified by the company in its press releases and then further hyped and promoted by stock promoters. Live Ventures has put out multiple press releases touting tremendous new developments. In fact, we can see that the information that is touted in their press releases does not match what the company has disclosed to the SEC. Live Ventures states that Isaac Capital Group (which is solely controlled by Live Ventures’ CEO Jon Isaac) has locked up “ALL” of its shares for 5 years, implying that the CEO cannot sell his shares. Yet in addition to the 800,000 shares which have supposedly been locked up, Isaac has access to around 700,000 additional shares via warrants / options which have average exercise prices as low as $4.14 and which expire in less than 2 years. THE WARRANTS ARE EXCERCISEABLE IMMEDIATELY – meaning that Isaac can exercise and sell over $10 million of stock any time he wants. 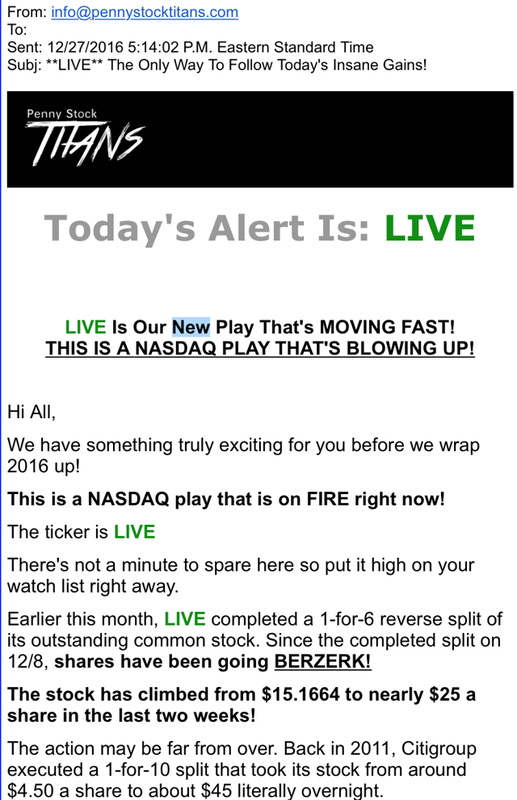 Live Ventures put out a press release claiming that the company achieved EPS of $8.92 in 2016. This is WRONG and is inconsistent with Live Ventures’ SEC filings. First off, the $8.92 which was touted in Live Venture’s press release was calculated by subtracted the 800,000 shares which Isaac agreed to lock up. This is wrong. Even in its own SEC 10K filing, Live is not able to calculate EPS this way. The number as shown in the 10K is actually $5.40. So Live Ventures has already overstated its EPS in the press release by 65%. In fact, anyone running a text search on the 10K for the number “$8.92” will find no hits at all. But then it gets better. Live Ventures didn’t even realize a true profit at all. Live Ventures LOST MONEY. The GAAP Net Income number provided the company was $17.8 million. But to achieve this, the company added in almost $19 million of arbitrary one time accounting adjustments, some of which appear to have no precedent in public company accounting. So in fact, Live Ventures did not post a true profit at all – instead, Live Ventures actually lost nearly $2 million. These one time arbitrary adjustments (made at the company’s own discretion), are broken down in detail below. In fact, Anton & Chia is not even a top 50 audit firm. It was just cited (in September 2016) by the PCAOB for multiple egregious audit deficiencies, including failure to conduct proper audits in accordance with GAAP (which is exactly what I see at Live Ventures). The firm’s client list has heavy inclusion of imploded China/Asia reveres merger bulletin board stocks which trade for just pennies. Some no longer trade at all and have failed to file with the SEC. And oh, by the way, the SEC does not “approve” audit firms at all. Ever. That is not what they do. So once again, the information Markowski uses in urging investors to place “market orders” is egregiously wrong. The information on Anton & Chia is publicly available and easy to find with just a 5 minute Google search. In November, Live Ventures announced an acquisition of “Vintage Stock” which it touted was going to bring in massive revenues to the company and involve no dilution. Given the two press releases above, investors have every right to be skeptical. Within weeks, the company was already making large downward revisions in its projections. Until we see a detailed 8K for the acquisition, we have no idea what to expect from this acquisition. (Although I do provide more detail on Vintage below). Live Ventures’ stock has shown a repeated pattern over time. When the stock trades at a very low price, a reverse split occurs to raise the price up and reduce the float. At the same time, some new acquisition or corporate development is announced. Simultaneous paid promotions (which have now run into the millions of dollars) help to temporarily drive the stock up. But when the business fails to produce results, the stock price falls again and the process is repeated. The most recent promotion campaign saw the stock triple in November to December 2016. As in the past, there was a reverse split which coincided with some sort of “news”. As in the past, there is the presence of heavily compensated stock promoters. And as in the past, the stock price quickly showed a reaction, tripling in a few weeks. Over time, stock promoters are getting more sophisticated. In the past, their hyped-up promo material would sit out in cyberspace for extended periods of time, even after the promotions ended. This would simply provide ammunition for people like me to discredit the promotions as the stock prices began their inevitable implosions. But now the promoters have often wised up. Their promotions usually go up on specialty sites designed just for the promotion. The promotion material is then removed once the stock price soars. After all, once the stock price rises and they dump their stock, there is no ongoing benefit to maintaining a permanent record of the promotion. In other cases, stock promoters use huge email blasts to millions of retail investors. Because they do not appear on web sites, the information behind these promotions is usually untraceable. Fortunately, there are some of us out there who sign up for as many promo emails and sites as possible and then store all of the emails. And also in some rare cases we can still track down the occasional promotion that has not yet been deleted, such as the one below. (I have saved pdf copies of this because I expect the material to be deleted). This one (“Stock Market Leader”) comes from the promotion last dated December 27th, 2016. So just a few days ago. Note that this is just before the stock soared and that the promoter was paid $15,000. So now we can see that in just a few weeks in December, around $100,000 has been spent on pumping up the stock by promoters who know that the stock is going to decrease when the short term campaign ends. And again, so far this is just what I have been able to find. There is likely much more out there that has already disappeared. Shown above are promotions from Ultimate Stock Alerts and a variety of affiliated stock promotion firms tied to Pro Trader Elite LLC. Live Ventures (and formerly Live Deal) have also been frequent promotions tied to “Goldman Small Cap Research”. GSCR is a “paid for” research firm which touts microcaps and which has no connection to Goldman Sachs. People pay Goldman to write favorable reports. That’s GSCR does. I highlighted both Ultimate Stock Alerts and Goldman Small Cap in this exposé on the promotion behind fraudulent Forcefield Energy. Both Ultimate and Goldman were paid to promote Forcefield. Following my article, the stock was quickly delisted and went to zero. The Chairman and 8 others were imprisoned following their indictment in this $100 million fraud. We can also see that these promoters use a maze of paying parties to obscure who is really behind the promotion. Many times, seemingly independent promotions all tie back to ProTrader Elite, which then uses a variety of different names. My favorite is “Small Cap Firm“. Small Cap Firm gets paid by ProTrader Elite to sub-run additional promotions using the same information. It took me days of digging to find this, but ultimately I was able to find an “orphan” page which does not appear to be linked to anything else, which describes how the promotions work and how they will affect investors. Click here to read the whole thing. But here are a few examples. Again, these all tie back to firms (such as ProTrader Elite) which work together along with the firms who are currently receiving millions of dollars in order to promote Live Ventures. What will happen to the shares that we hold during the Campaign? We will sell the shares we hold while we tell investors to purchase during the Campaign. What will happen when the Campaign ends? Most, if not all, of the Profiled Issuers are penny stocks that are illiquid (they do not have much trading volume at all) and whose securities are subject to wide fluctuations in trading price and volume. During the Campaign the trading volume and price of the securities of each Profile Issuer will likely increase significantly. When the Campaign ends, the volume and price of the Profiled Issuer will likely decrease dramatically. As a result, investors who purchase during the Campaign and hold shares of the Profiled Issuer when the Campaign ends will probably lose most, if not all, of their investment. Why do we publish only favorable Information? We only publish favorable information because we are compensated to publish only favorable information. Is the Information complete, accurate, truthful or reliable? No. The Information is a snapshot that provides only positive information about the Profiled Issuers. The Information consists of only positive content. We do not and will not publish any negative informationabout the Profiled Issuers; accordingly, investors should consider the Information to be one-sided and NOT balanced, complete, accurate, truthful or reliable. What will happen if an investor relies on the Information? If an investor relies on the Information in making an investment decision it is highly probable that the investor will lose most, if not all, of his or her investment. Investors should not rely on the Information to make an investment decision. So just how extensive has the promotion campaign been ? There is one location out there which has archived just a few of the promotion emails out there. That site does not even have the most recent mailers (which I already showed above) and it does not track to the websites such as “Stock Market Leader” (which I also showed above). We can see that a large variety of seemingly “independent” stock promotion firms have now been paid millions of dollars to run this type of campaign on Live Ventures. As shown above, the information is only positive and consists of pure hype to drive the share price up. In the past, one promoter, was actually paid a whopping $1 million to run a short term promotion campaign on LIVE. Here are just a few of the many titles used in various email campaigns. So that implies a target price of $30-42 now that we are past the reverse split. Market Byte was paid $15,000 for this. I want everyone to take a look at it TODAY and keep **LIVE** on your Radar for the LONG TERM!! I will be back to talk about “LIVE” at another date in time…. Hopefully it will be one this Play has already produced some INSANE Gains from it’s current low! Again, there are well over 100 examples of such promotions on Live, with paid amounts varying from a few thousand dollars to as high as $1 million. And again, these are just the ones we can track down. Many more have likely been removed from circulation and can no longer be found. Here are the 9 articles that Markowski has written over just the course of 6 weeks. Before getting into the specifics on Michael Markowski, readers should take a step back and get some perspective on these recent articles. As I will show, these articles deserve a high level of scrutiny REGARDLESS of who wrote them. First, the timing is noteworthy. The author’s articles on LIVE never appeared until a massive simultaneous paid promotion was being launched on Live Ventures, including payments of hundreds of thousands of dollars to paid stock promoters. As in past promotions, this surge in promotional activity coincided with a reverse split along with multiple apparent corporate developments. Yet these developments alone had no impact on the stock, instead it was the promotions that boosted the stock. And these articles only appeared at the exact same time as the promotions. Second, the sheer number of articles deserves attention. In the space of just 6 weeks, the author released an urgent flurry of 9 articles. Fourth, the blatant errors, inaccuracies and omissions deserve special attention. A few of these are included below. Again, the point I am trying to make is that when we see this combination of problems, we should immediately start to be highly concerned about the author and his content. But this content didn’t come from just any author. It came from Michael Markowski. That makes the problem visibly much bigger. Named by Fortune as one of its “50 Great Investors”. What Mr. Markowski fails to include in this “prestigious” biography is that he was expelled from the securities industry for committing extensive securities fraud and then barred by the SEC from future activities. This was not a “minor” securities fraud case. Markowski’s conduct with respect to market manipulation and customer complaints regarding unexecuted sell orders demonstrates a high degree of scienter. Scienter is a legal term that refers to intent or knowledge of wrongdoing. This means that an offending party has knowledge of the “wrongness” of an act or event prior to committing it. According to the SEC, below is what Markowski did. Readers can note for themselves the eerie similarities to his current articles on Live Ventures. Markowski then “restricted the supply of these securities by discouraging brokers from accepting customer sell orders, reprimanding brokers who did accept sell orders, paying brokers commissions on buy orders but not sell orders, and fraudulently delaying the execution of customer sell orders for days, weeks, or even months. The violations above occurred with at least 3 different stocks. But these violations themselves were not isolated. Markowski also has a disciplinary history. He failed to provide the NASD with access to Global’s books and records in the initial stages of the NASD’s investigation of the same market manipulation at issue here. This is a serious violation of the NASD’s Rules of Fair Practice for which Markowski was censured, fined $50,000, and given a two-year suspension in all capacities and a permanent bar from acting as a principal or having any financial interest in any NASD member firm. As I see it, Mr. Markowski has acted in a similar fashion with Live Ventures. He seeks to drive up the price in the same way, by inciting “market orders” in a small cap, low float stock. He continues to urge additional buying even as the share price soars, continually raising his target price, using specific prices as he did in the fraudulent conduct above. He then seeks to dissuade investors from selling even as the share price begins to fall apart. The SEC also noted that following his involvement the 3 stocks above, the share prices all collapsed. 1. For Live, he stated that “Before conducting any additional analysis, I checked out its auditor. I discovered that it was Anton Chia, which is one of the most respected and SEC approved auditing firms.” As shown in the next section. Anton & Chia was cited in September 2016 for multiple egregious audit deficiencies, its clients list largely consists of imploded reverse mergers for China/Asia OTC stocks, many of which either trade for just pennies or no longer report or trade. 2. He also stated that LIVE had positive Free Cash Flow of positive $2.0 million in Q4 2016. This is provably wrong. In fact, Live Ventures had a Free Cash Flow of NEGATIVE $2.5 million. 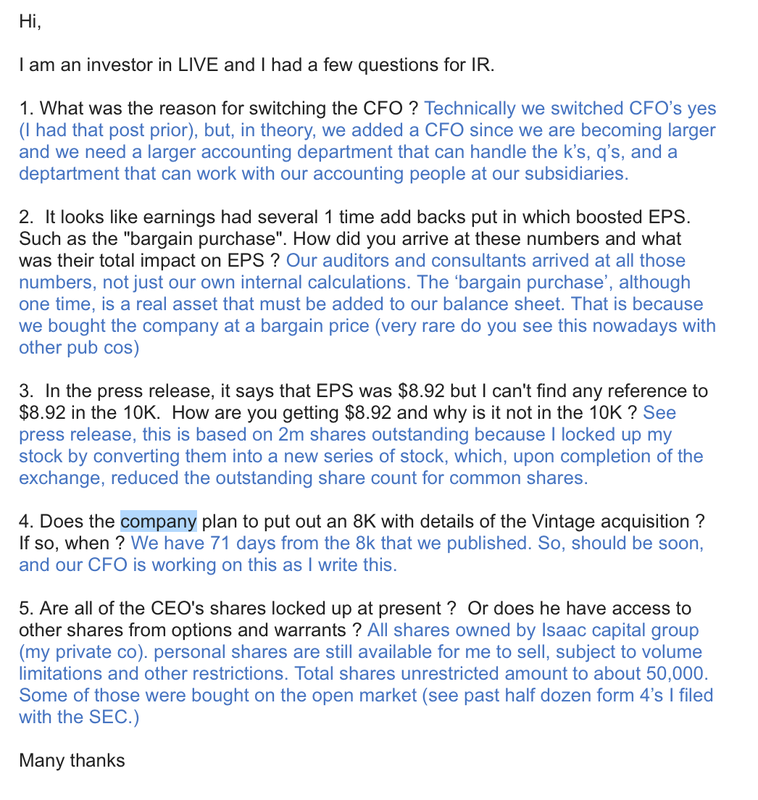 As a self described “cash flow expert”, Mr. Markowski should certainly be familiar with the standard definition of FCF: “Free cash flow (NYSE:FCF) is a measure of a company’s financial performance, calculated as operating cash flow minus capital expenditures.” It is actually very simple and well defined. Yet for some reason, Mr. Markowski decided to add $3.3 million back for prepaid expenses. This is simply an arbitrary adjustment made by Mr. Markowski to arrive at a positive number. 4. Stock “bulls” commonly try to blame short sellers when a stock price implodes. They try to use this to convince retail buyers to buy the stock. 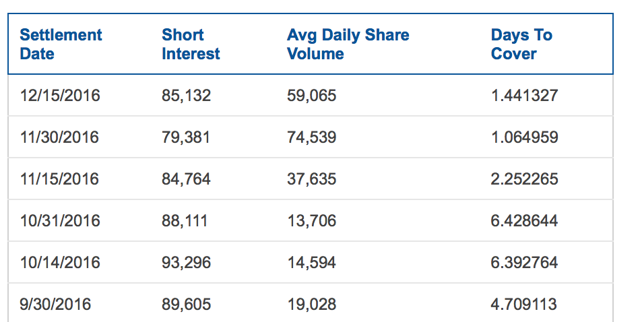 Markowski stated that “Based on 2.2 million shares trading on December 28th, the probability is high that short sales accounted for a significant percentage of the volume.” In fact, we can see the amount of short interest over time at NASDAQ.COM. Over the past 4 months, total short interest has ranged from 70,000-90,000, so nothing near the millions of shares that Markowski implies. From the site iBorrowDesk, we can see that total additional shares available to be shorted has seldom been more than 25,000 on any given day. And before he tries to blame the “naked shorting” bogeyman (another favorite excuse and distraction for stock “bulls”), we can see that the SEC also tracks the total amount of shares being shorted “naked”. It is called their “fail to deliver list”.For Live Ventures, the most recent number of “failed to deliver” (i.e. naked shorted) shares amounted to just 4,054 shares (yes, just four thousand shares). The reality is that short sales have accounted for virtually none of the volume. Anyone who claims 40 years in the industry should be able to find this information in just a few minutes. 5. Markowski states that “CEO Jon Isaac owns 1.1 million shares”. As shown below, Isaac controls over 1.5 million shares, nearly half of which are available for immediate sale via warrant exercise. That is a difference of nearly $10 million into the CEO’s pocket and is directly relevant when we are looking at stock promotions. Beyond the inaccuracies we can see multiple statements which are deeply reckless in his explicit buy “recommendations”. 2. He also urges investors to place “Good Til Cancled Limit Orders” to buy at a price of $26.25 (even as the share price was plunging to $22). The effect of this would obviously be to support the share price. 4. Assuming that LIVE’s outstanding shares remain at 2.8 million the minimum price for its shares by the end of 2017 could potentially range from $45 to $180.00. 5. “LIVE’s shares are being shorted instead of being aggressively purchased. Its because should an investor or conduct a preliminary analysis and not dig much deeper the tendancy is to short instead of buying LIVE shares. Upon investors becoming aware of this anomaly the share price will go to above $100. This report will enable you to fully grasp the significance of the anomaly and why a short squeeze is inevitable.” As shown above, anyone with even a few years of experience in the market would know that this information is provably false with just a few minutes of looking. 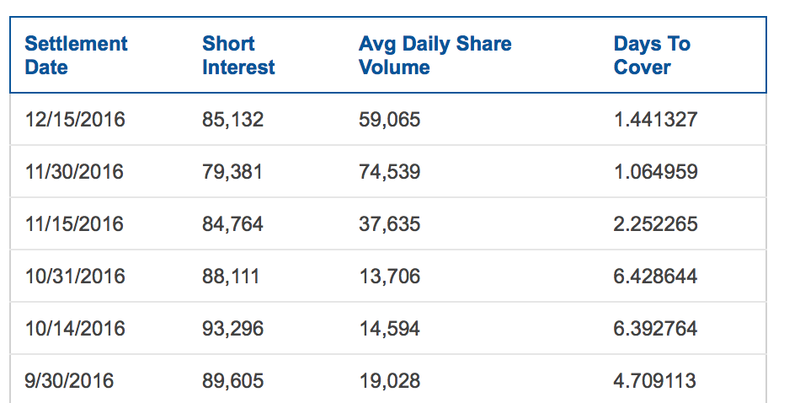 For reference, here is the most recent short interest data from NASDAQ.COM. It shows that short interest in Live Ventures has consistently been negligible. Mr. Markowski would know that with just a single Google search of “LIVE Short Interest”. In every promotion campaign, it is necessary to have some talking points for the promoters to sell to retail investors. This is what I refer to as the “promotion fodder”. As will be shown in greater detail further below, each of these items has been overly hyped or misrepresented outright in promoting the stock. In fact, even the press releases put out by Live Ventures itself contain information that does not match its SEC filings. Not surprisingly, the erroneous information is heavily to the advantage of the share price. In December, Isaac Capital Group, our largest stockholder, agreed to lock up ALL of their shares for five years (through December 31, 2021)… Accordingly, our common stock was reduced from approximately 2.8 million to 2.0 million shares. Isaac Capital Group is controlled by Live Venture’s CEO Jon Isaac. He is the largest shareholder. The message here is clear. The CEO cannot sell any of his shares until 2021. Clearly this is a strong vote of confidence in the stock, and it has helped support the share price. But that assumption is wrong. The following information can be found in the footnotes (part F-19) of the 10K. If we look at warrants / options held by Jon Isaac and/or his Isaac Capital Group, we can see that he has control of more than 1.5 million underlying shares in total. This includes almost 590,000 shares underlying his warrants. These warrants have an average exercise price of just $4.14 and they actual EXPIRE in less than 2 years. THE WARRANTS ARE EXCERCISEABLE IMMEDIATELY. So here is the kicker, by appearing to lock up “ALL” of his common stock, the CEO supports the share price. He therefore can get a much higher price when he sells nearly 700,000 other shares that no one seems to have noticed. Even if the original shares go to zero in 5 years, the CEO would stand to make more than $10 million if sold at current prices. Without giving the “appearance” of a lockup, this would not otherwise be possible for the CEO. And again, the warrants can be exercised for just $4.14, they are exercisable immediately and they EXPIRE in less than 2 years. The “lockup” is nonsense. But it gets even better. In order to effect this apparent “lockup”, the CEO “converted” his 800,000 shares of common stock into basically identical preferred shares. As a result, when Live Ventures announced their EPS for 2016, they divided their “earnings” by 2 million shares rather than 2.8 million shares. This is how the company seemingly reported an EPS of $8.92. But that $8.92 was ONLY announced in the flashy press release. It was not included in the SEC filed 10K. (Feel free to run a text search through the 10K for yourself). 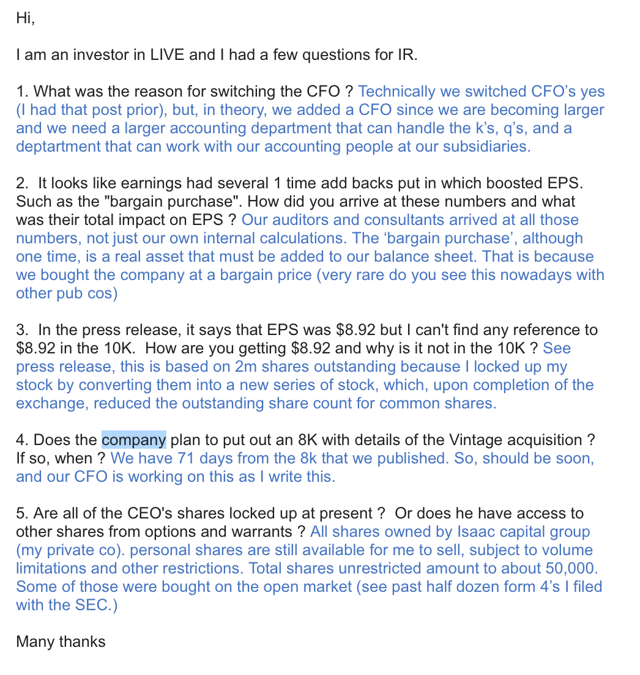 In the actual SEC filings, we can see that Live Ventures was forced to report the actual EPS number of $5.40. And as we see next, even that $5.40 was EPS was only the result of one-time GAAP earnings manipulation. Without that manipulation, the company actually would have reported a NET LOSS, NOT ANY NET INCOME AT ALL. 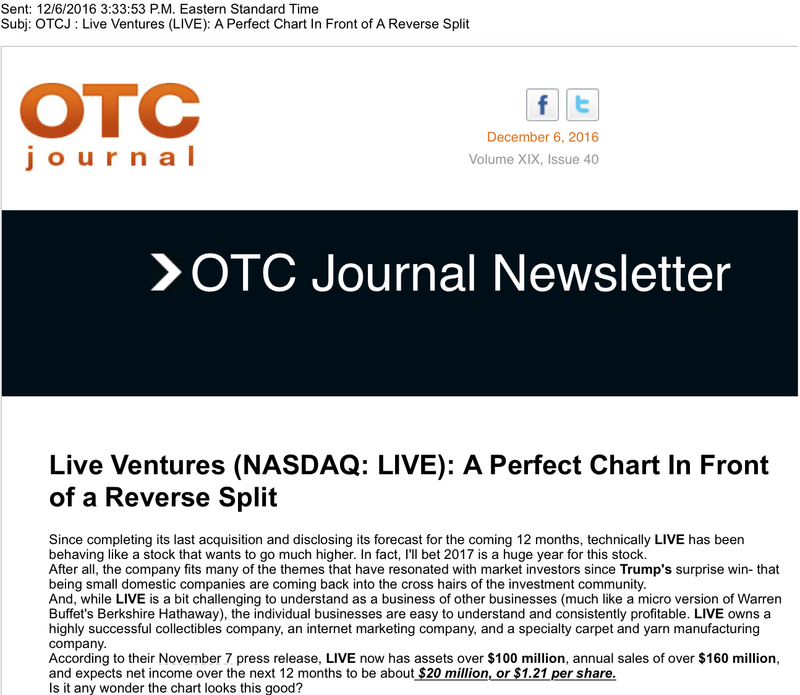 The tremendous promotion surrounding Live Ventures appears to have really kicked off right around the time when Q4 earnings were announced on November 21st, 2016. At that time, the company telegraphed that it expected “record” year-end financials would be announced in December. Many promoters as well as “bulls”, including Markowski, began amplifying these expectations and urging investors to aggressively purchase the shares. Live Ventures certainly did not disappoint (well, at least not on the surface). On December 29th, the company announced (in a press release only) that it had reported “record” earnings of $8.92 per share. Hype around the upcoming earnings caused the share price to briefly spike by as much as 40%, from $23 to $32. But once the 10K was released and read, the stock quickly gave up all of these gains. As already shown above, the $8.92 number is clearly wrong. It was only achieved by using a too-small share count which was not included in the actual SEC filings. The SEC filed 10K shows EPS of $5.40. But even that $5.40 number is not an accurate representation. Live Ventures reported total Net Income of $17.8 million for 2016. This number is WRONG. In the press release, the company then dividend this $17.8 million by 2 million shares outstanding to report EPS of $8.92 in the press release. As shown above, this number is also WRONG. In calculating the $17.8 million in Net Income, Live Ventures added in multiple one time arbitrary items which it added at its own discretion. These were not the result of any ongoing business. As you can see from the names of the line items above, each of these items are non-operating items which have nothing to do with the ongoing business of Live Ventures. Together, these items count for more than 100% of the supposed “profit” reported by the company. The bulk of these items were added at the discretion of management in a way that is simply arbitrary. They simply added them because they wanted to. The reality is that without the benefit of these arbitrary accounting manipulations, Live Ventures didn’t show any profit at all. Instead, Live Ventures actually LOST around $1.5 million instead of EARNING over $17 million. So the question becomes: how does Live Ventures auditor allow the company to get away with such egregious behavior ? It’s pure and simple, LIVE’s earnings increased by $4.5 million due to the company being extremely conservative in valuing and negotiating an acquisition. It is what it is! I had never in my 40 years seen the booking of such an entry on a company’s Financial Statements….Before conducting any additional analysis, I checked out its auditor. I discovered that it was Anton Chia, which is one of the most respected and SEC approved auditing firms. I agree with Markowski in that “bargain purchase gain on acquisition” is a very rare item. I have been deeply involved in the stock market since the late 1990’s and I have never seen it either. It is basically a made up item used to arbitrarily boost the company’s earnings. As for the audit firm of Anton Chia, Markowski’s statements are flat out WRONG. That firm is neither the “most respected” nor “SEC approved”. Anton Chia is not a big 4 auditor. It is not a top 10 auditor. In fact, it is so obscure that I can’t find any mention of it in the top 50 auditors. But we’ll let that slide for now. First off, the SEC does not “approve” auditors. So that statement is flat out WRONG. Second, in September 2016 (yes, very recently), the PCAOB disclosed egregious deficiencies in the audit practice of Anton & Chia. Their report is publicly available and easy to find. Certain deficiencies identified were of such significance that it appeared to the inspection team that the Firm, at the time it issued its audit report, had not obtained sufficient appropriate audit evidence to support its opinion that the financial statements were presented fairly…In other words, in these audits, the auditor issued an opinion without satisfying its fundamental obligation to obtain reasonable assurance about whether the financial statements were free of material misstatement. All told, the PCAOB cited 11 such material deficiencies, several of which appear to be strikingly similar to the accounting shenanigans that we see at Live Ventures. Many audit deficiencies involve a lack of due professional care. Anton Chia does not disclose its client list on its website. The only lists I can find are on the site “Auditor Carousel” which highlights auditor changes typically due to the implosion of the auditor or due to auditor shopping by microcap companies. So it is hard to see how Markowski comes up with Anton Chia as being among the “most respected” auditors. In fact, I view having an auditor like Anton Chia as being more of an embarrassment than a mark of honor. In any event, to me, the use of Anton Chia helps to explain how a $1.5 million dollar net loss was magically transformed into an accounting profit of almost $18 million without any underlying business activity to support it. On November 7th, Live Ventures announced the acquisition of Vintage Stock, a retailer which buys and sells things like used movies (including VHS), music CD’s and video games. The cost of the acquisition was $60 million and was done via bank financing (i.e. no stock was issued). At the time of the acquisition, the stock barely budged. On the day before the acquisition, the stock sat at $10.98. On the day the acquisition was announced, the stock hit $11.52, up a few percent. On the next day, the stock was flat. No one cared. The reason for the lack of enthusiasm is that trading music CDs and old video games in retail stores is not a growth business anymore. Much of this is now simply done online. Videos, music and games can simply be downloaded without visiting a store. If I want to buy a physical copy, I do so via Amazon for a fraction of the price. Vintage also bought a few locations of Borders Books as that company too was going bankrupt. Vintage has stated that it follows an 80-20 rule, where the 20% consists of selling books and magazines, just like the bankrupt Borders used to do. Vintage also engages in the odd niche business of repairing scratched music CDs, for those out there who still use music CDs. Vintage even continues to carry game cartridges for vintage consoles such as Atari and the old Nintendo, which were popular in the 1980’s. There was no detailed 8K released with legacy or pro forma financials, such that we don’t really know what Live Ventures purchased here. But we do know that Vintage has 40 locations spanning 5 states, with 900 employees, such that getting $60 million in bank financing should not have been difficult for the company. Vintage could have certainly borrowed that much money itself. For example, if Vintage owns $60 million of real estate, the Live Ventures could have just paid $60 million in exchange for $60 million in real estate, with the business itself being largely worthless. But as we have seen, stock promoters needed some fodder for their promotions. And even though Live Ventures was clearly stepping into the shoes of several bankrupt predecessors, the promoters were able to spin it for a few weeks. The website for Vintage describes its inventory of videos, music and games as being “massive”. So a second theory is that the “value” here was simply that of over valued obsolete inventory. After all, what are rental DVD’s worth today now that everyone can simply stream from Netflix, Hulu or Amazon for just a few dollars without ever leaving their home. If Live Ventures is valuing these rental videos “at cost” of $20 or more, then a $60 million valuation could be easily justified. But obviously older titles of used rental videos now have a value which is almost nil. Because there has been no detailed 8K filed, we simply have no idea. But just as with the other items of fodder, the promoters have been quick to predict multi bagger share price increases based on the minuscule amount of vague and unsubstantiated information released by Live Ventures. It is notable that at the time Live Ventures announced the deal in November, that annual sales were immediately expected to increase to $160 million. But just a few weeks later, this number was already quickly being reduced to $120 million. They had therefore been overstated by 33%. No explanation for the steep revision was given. The point is this. Live Ventures completed this acquisition in November and immediately put out a press release touting several unsubstantiated forecasts. Live Ventures never put out an SEC filed 8K with any concrete details. As we have seen in the past, there have been substantial discrepancies between Live Ventures press releases and its SEC filings. We literally have no idea what Live Ventures has purchased here because nothing has been disclosed. The company is already backing away from its initial vague rosy statements. But so far the promoters behind Live Ventures have been quick to seize on the acquisition as further proof that the stock is going to catapult upwards by several hundred percent in 2017. Even a casual analysis of Vintage reveals that the company is in various dying businesses including DVD and VHS rentals, CD music exchange and CD/DVD scratch repair. Vintage has repeatedly been buying out the locations of other dying businesses such as Blockbuster, Borders and Hastings, all of which went bankrupt / out of business. All of the commentary above has been supported with links to external sources, including the company’s own SEC filings. I have demonstrated clearly that CEO Jon Isaac has an extra 700,000 shares which are available through warrants / options, most of which are exercisable immediately. This information can be found clearly in the 10K. In the commentary above I also showed very clearly “what was the impact of the EPS add backs and how they were calculated”. The answer is the earnings went from $17 million to a loss of around $1.5 million. I broke down what each component was. I also showed that the number $8.92 for EPS was included in a press release, but this is significantly different than what is in the 10K filed just 1 day later. I suggest that readers read the response below and then re-read the commentary above, clicking on the links to the various filings. I note that in the responses below, in 4 out of 5 items, the response clearly did not actually answer the question that I asked. For question number 4 (which was answered), the company has stated that they have 71 days to file an 8K for the acquisition. This should be interesting given that the CFO was just hired yesterday. 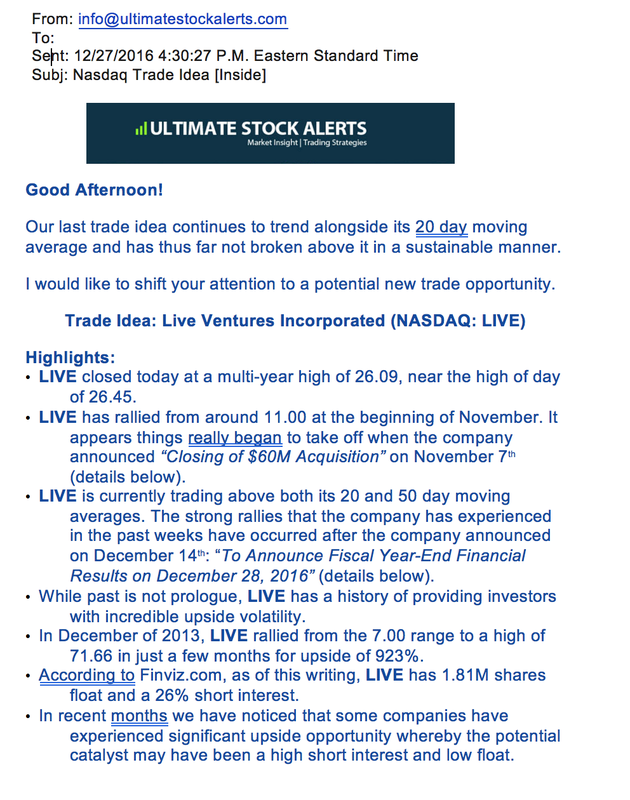 Live Ventures is a stock promotion which has been aggressively pumped by some of the most notorious stock touts in the business. These promoters have been paid millions of dollars to present skewed information on Live Ventures. Buried in their disclosures is the fact that they expect the stock to rise sharply on their promotion and to then plunge when it ends. They warn that anyone who buys into the stock should expect to lose “most or all of their investment”. These are the same stock promoters who have blatantly promoted frauds such as Forcefield Energy, which was delisted and went to zero within just a few days of my report on that company. The most recent stock “bull” to get behind Live Ventures is Michael Markowski. Markowski began writing about Live Ventures just as the paid promotion was picking up steam and he quickly put out 9 articles in just 6 weeks. He has aggressively urged readers to put in “at market” buy orders, driving up the stock. He analysis contains numerous statements which can be proven totally false with just a few minutes of checking. Markowski was barred for life by the SEC following multiple instances of stock fraud which the SEC described as “egregious”. The bar on Markowski was deemed by the SEC to be in the public interest. The ample promotion fodder on Live Ventures is easily debunked. The supposed “lockup” of shares held by the CEO ignores around 700,000 shares which can be sold via exercising deep in the money warrants and options. These options are exercisable immediately and expire in less than 2 years. The tremendous surge in “earnings” from Live Ventures was simply the result of accounting manipulation, including where Live Ventures “wrote up” the assets in acquired in the past. It made these various adjustments at its sole discretion, and thus transformed a $1.5 million loss into a $17 million accounting “profit”. As shown, Live Ventures uses a penny stock auditor known for auditing imploded China/Asia OTCBB stocks. This same auditor was cited by the PCAOB in 2016 for numerous and egregious audit deficiencies, including ones which bear striking similarity to the adjustments seen at Live Ventures. The recent acquisition of Vintage Stock is effectively the equivalent of buying Blockbuster Video and Borders Books, both of which went bankrupt due to the transition to online viewing and downloading. Even a cursory view of Vintage’s website reveals that it still deals heavily I things like VHS cassette tapes and cartridges for 20 year old gaming consoles. The acquisition simply made for more talking point fodder for the stock promoters. The promotion on Live Ventures has clearly come to an end. That is why the stock has been falling each day and why volume has been declining.